With video and content marketing becoming more and more important to marketers – including marketing to internal clients — managing growing video libraries within an organization can become a challenge, and it’s one a Montreal vendor is looking to solve. 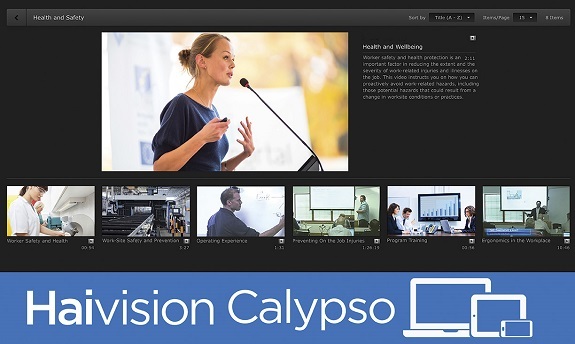 Montreal-based Haivision, which also develops digital signage solutions, has launched the Calypso Enterprise Video Platform. It’s a secure and centralized hub from which companies can manage, store, and share video both live and on demand with employees within the company. Looking to make it easier to send video across the company – which may include multiple offices – without getting the IT department involved, Calypso features a web-based user interface which allows content administrators to organize videos so they can be found easily by employees. It includes tools for authentication, compliance, content curation and search. Multi-location support: Video can be distributed to multiple locations, hosted locally and viewed on employee devices without significant network loading. Simulated-Multicast: Calypso supports both unicast and simulated-multicast enabling broad scale live video distribution within the enterprise without significant server or network loading. Authentication: With integrated authentication, administrators can ensure the right viewers have access to the right videos, allowing content to be distributed across a department, a role, or to select individuals, with different privileges from viewing only to downloading, sharing and editing. Compliance: The compliance reporting tool helps companies track and validate who has watched what in order to ensure the company is meeting requirements for training, standards enforcement, and so on. Curation: Administrators can choose what content is highlighted, selecting content for channels such as “not to me missed” and even targeting the recommendations based on employee role and responsibility. Search: Metadata, search and filtering are all supported to help users find videos and specific moments within a video.